Classic literature teaches us a lesson in farming. 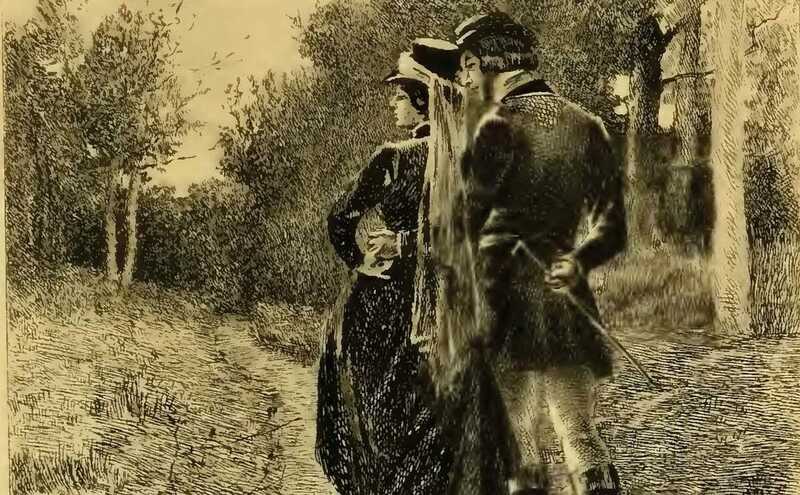 Madame Bovary strolls with Rudolph in an etching from a 1897 edition of the novel published by George Barrie & Sons. / Courtesy archive.org. This description of the market in Yonville occupies barely a paragraph in “Madame Bovary.” In most readers’ memories, it’s overshadowed by the Agricultural Show in the next chapter, a scene in which the pompous ceremony and the even more pompous speeches of officials on the reviewing stand serve as a backdrop for the seduction taking place upstairs in the deserted council chamber of the town hall. Flaubert has his small-town playa Rodolphe pitch Emma, a young doctor’s wife, a line just as one of the judges announces the prize “‘for the best manures.” Shortly after that, Emma, a woman remarkable only for her prettiness and habit of daydreaming, embarks on a path of adultery that will end in her financial ruin and death. When the novel appeared in print in 1856, the French government tried the author for obscenity. Dramatically, the farmer’s market is noteworthy mostly because it’s where Emma first sees Rodolphe, noticing his expensive green and yellow outfit while she is leaning out her window “watching the crowd of yokels.” In French, the last word is rustres, which sounds a little better. I suspect Flaubert uses it to indicate Emma’s frustration at where life has landed her: her cramped surroundings, her dull neighbors, her worshipful sad-sack of a husband. The Oxford English Dictionary calls ‘yokel’ “a contemptuous term for a (stupid or ignorant) countryman or rustic,” and it must be said that in the late 1830s, when the novel’s events take place, to be a country person in France was almost by definition to be ignorant, with little or no access to the lively — and often scandal-mongering — newspapers that informed the citizens of Paris. A market like the one in Yonville served a function that was more than economic. It was where country people, in addition to bartering their goods and produce, traded for the information they could only get in town. It would be at the market that Yonville’s peasants first learned about the bloody suppression of the Paris Commune, and it would be there that they would see the latest fashions, or their provincial variants: longer in the skirt, probably, not as well fitted, and woven from coarser fabrics. In many ways, the farmer’s market in Yonville isn’t much different from the ones I used to visit in the Hudson Valley, 150 years after “Madame Bovary” was first published. Substitute trucks for carts, change some of the products on sale, and make sure the eggs and cheese are displayed on tables as per the edicts of the New York State Board of Health. But no one would characterize the demographic as “yokels.” The customers included writers, editors, movie people, realtors, veterinarians, college professors and auto mechanics. One vendor was an orchard-keeper who was one of the founders of the Greenmarket movement; another was a purveyor of farm-raised venison who in a previous life had been a curator of mammals at the Bronx Zoo. There was also an Orthodox Jewish ex-junkie who baked the crustiest, moistest bread north of Orwasher’s; we used to enjoy trading insults, as if we were haggling over a cart on Essex Street and not in a town that boasted America’s oldest continuously-operated inn. What remains unchanged is the farmers market’s role as a site of informal capitalism – of direct exchanges. Some of this was because my farmer’s market was situated barely 100 miles from the famous one in Union Square. Whenever I happened to stop there on one of my trips into New York, I’d see many of the same vendors, selling the same beets and lettuce and artisanal cheese at markups appropriate to a city where even your shadow has to pay rent. But beyond this, “yokel” no longer means much, except as one of those insults that reflects more poorly on the one who uses it than on those it is used against. The gap between town and country has shrunken (except maybe in politics, where it’s transmogrified into the gap between blue states and red ones). Town and country have access to the same 500 TV channels and, increasingly, to the same high-speed Internet connections, thanks to which I can check corn prices from my office in downtown Pittsburgh while a grower in North Dakota, whose kid will be starting classes at the university where I teach, can reserve a room here through Airbnb. We can both waste part of the day watching adorable baby animal videos on YouTube, though the grower probably wastes less of his, given the respective dollar-value of our time and our respective familiarity with adorable baby animals. I’d bet he knows as much as I do about what went down in that elevator between Jay-Z and his sister-in-law. What remains unchanged is the farmer’s market’s role as a site of informal capitalism — of direct exchanges between the people who produce goods — from beets to borage and from goat’s-milk cheese to goat’s-milk soap — and the people who want them. No big Agra, no multi-million-dollar marketing campaigns, no food stylists or flavor consultants or snippy middle managers lurking behind the sales counter to ensure the requisite number of transactions per minute. Dawdling encouraged. While farmer’s markets are still markets, they’re also social events. If Emma Bovary were alive today in the small town where I used to make my home, she might be scanning the crowd on market day, but she wouldn’t be thinking “yokels.” She might have a thing for the guy who sells microgreens, the one with the gray ponytail and the lingering smile who used to do something in tech. Town or country, there are always people who get bored with their partners and go somewhere else for what may or may not be love. And Emma’s neighbors would do what people have always done at the farmer’s market: gossip. Being savvier than the inhabitants of her Yonville — and able to see something that was going on right before their eyes — they might very well gossip about her. Her poor husband would still be the last to know.